Outdoor living spaces designed for entertaining. Making your backyard and garden more accessible. Maintain your lawn and garden through all seasons. Keeping your lawn in perfect shape all year long. At Erney Landscaping we will be happy to assist you with all your landscaping and property needs. 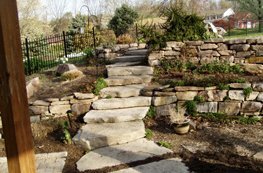 Take a look at our variety of landscape services and let us create your next beautiful landscape design. 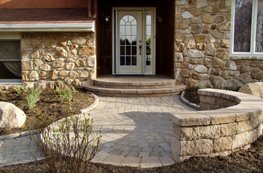 Tailored for your property's specific needs to create timeless effects and have your curb appeal grow with your landscape. We can add low voltage lighting to create evening accents to your landscape. Outdoor living spaces designed for comfort and entertainment and to make accessibility to your garden a priority. 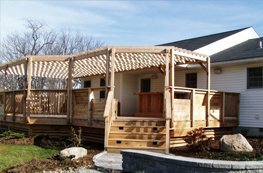 From total renovations to maintenance we provide the best outdoor space. 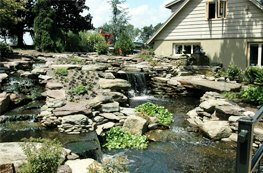 Erney Landscaping is committed to our customers and the Design, Build, Maintain philosophy. Please feel free to give a call with any questions about your ideas for your landscaping design project. As an award-winning design and build company, with over 20 years of experience, we pride ourselves on being a locally owned company and staple to the Lehigh Valley community. Our skilled team believes in the Design, Build, Maintain philosophy, which keeps us in contact with you and your landscape projects from the initial design phase through the professional build stage. We want to bring your creative, unique visions to life to create the perfect outdoor living space and garden. Let us bring a magical elegance to your home with our professional landscaping services. We also offer our clients, who we build relations with, with our excellence in our total project maintenance service keeping us connected to your project as it matures for years to come. We strive for excellence each and every project, large or small as we continue to provide a very diversified service. We are very dedicated to our professionalism and your happiness. Our testament to this is our 2006 Award For Professional Excellence presented by The Lehigh Valley Builders Association. We look forward to hearing from you, and to help make your outdoor living environment a dream come true.